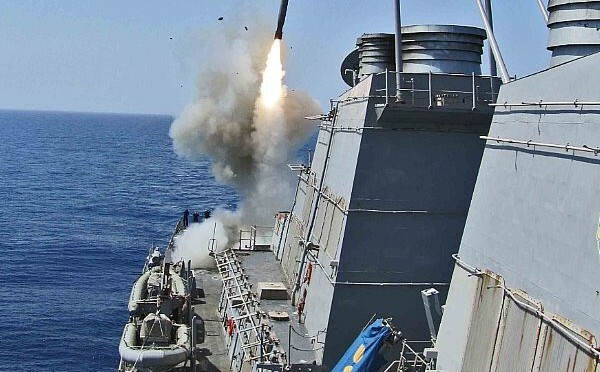 In the wake of TLAM strikes against targets in the Middle East by US Navy warships, we are reposting this guest article by LT Monika Chess, USN, former navigator aboard USS Barry (DDG-52) on the run-ups to a cruise-missile strike to provide a shipboard perspective of their planning and execution. 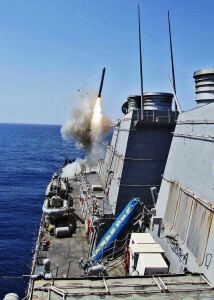 On March 19, 2011, USS Barry (DDG-52) was one of the first warships to launch Tomahawk Land-Attack Missiles (TLAMs) against targets in Libya in support of Operation Odyssey Dawn. Barry began 2011 by deploying in January with the Enterprise Strike Group in the Gulf of Aden and conducting counter-piracy operations. However, her mission unexpectedly shifted in March as she received tasking to steam independently to the Mediterranean Sea and join the international coalition of warships operating off the coast of Libya. Odyssey Dawn aimed to enforce the United Nations-sanctioned no-fly zone over Libya and stop Libyan leader Colonel Moammar Gadhafi’s forces from attacking civilians. After arriving in the U.S. 6th Fleet Joint Operating Area, Barry’s strike team conducted numerous training scenarios that built on the skills developed during the training cycle and ensured the ship maintained the knowledge and proficiency to monitor the surface picture, make proper reports, and successfully execute any mission. As the state of affairs between the Gadhafi regime and civilian forces worsened in Libya, the training scenarios became daily. On March 18, Barry was ordered to head to a preplanned launch position and stand by for tasking. The strike team was prepared and ready to execute a strike mission at a moment’s notice. On March 19, Barry received orders to conduct TLAM strike missions against strategic targets in Gadhafi-controlled regions in Libya. This was the first time Barry launched Tomahawk missiles for a real-world mission. “Most strike teams never launch in their careers, but Barry was given that opportunity,” said Barry’s strike officer LTJG Jason Haney. Barry launched more than 30 Tomahawks from her forward and aft Mk 41 Vertical Launch System cells during her first of four strike taskings. With each launch, there was a deafening roar and blinding light as the missile streaked upward. Sailors watched in awe as the cells emptied one after another and the missiles flew toward Libya. “The strike team was extremely focused. There was a sense of confidence as we accomplished our mission. I am extremely proud of my team,” said Chief Fire Controlman (FC) (SW) Ken Lilley, strike division leading chief petty officer. “We were confident in the accuracy of our missiles and that minimal collateral damage was caused by the strikes. It helps to ease our minds to know that we conducted these missions effectively and minimized the impact on innocent people,” said Barry’s combat systems officer LT Todd Grahek, one of the tactical action officers during the strike missions. This article appeared in its original form in the Summer 2011 issue of Surface Warfare magazine available here. LT Monika Chess served as the navigator aboard Barry during Odyssey Dawn and works in the admissions office of the U.S. Naval Academy.